Pattern: Tahki Stacy Charles - Esther Yun-Mancini's Cabled Chunky Turtleneck Vouge Fall/06 Advertising section. 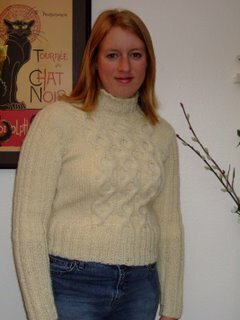 Yarn used: Lion Brand Alpaka, 30% Alpaca, 30% Wool, 40% Acrylic. Details: The was a quick knit with a totally different yarn than the pattern was designed for. Luckily I made the sleeves a lot longer and the body longer as well, probably by 5 inches. When I put it on, it fits just right, the measurements, seem pretty petite to me. Update: I forgot this sweater on the train to Copenhagen, so best wishes for a warm winter for whomever ends up with this.